Across all financial sectors—whether it’s telecommunications, energy, transportation, tech or agriculture—the largest multinational corporations are actively seeking to consolidate their global power by acquiring their competition. “Merger mania,” as it’s known on Wall Street, is not a new development, rather a perennial economic phenomenon. But while lucrative for a company’s shareholders and CEOs, history has shown us time and time again that unopposed monopolies are almost always bad for society-at-large. On the farm front, as we’ve discussed on numerous occasions, last September Monsanto announced its intention to merge with Bayer in a $66 billion deal. 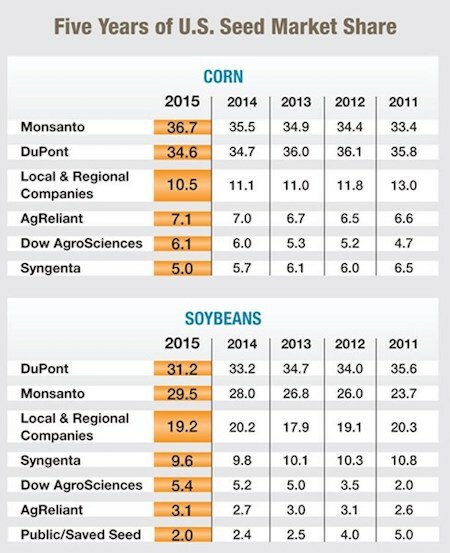 If the merger goes through, Monsanto-Bayer would dominate the chemical and seed markets alongside Dow-DuPont and Syngenta-ChemChina—the four other global agriculture and chemical giants expected to merge by the end of the year. As a result, American farmers, who have seen seed prices rise and incomes fall within the last decade, would face yet higher prices and less choice. While farmers continue to speak out against the deal, many incumbent politicians remain silent. Austin Frerick wants to go to Congress as representative of Iowa’s 3rd congressional district, which covers the southwest corner of the state, including Des Moines. To get there he is running in the 2018 Democratic primary, and stopping monopoloies is on of the central planks of his campaign. Frerick, 27, a former economist at the Department of Treasury, is part of a wave of younger progressives running for office as Democrats. He sees anti-trust issues as part and parcel of a progressive political agenda. Frerick also supports single-payer healthcare, a $15 minimum wage, reproductive rights, campaign finance reform and a universal higher education system. RAITT spoke with Frerick about Monsanto, corporate charity and rural communities. Rural America In These Times: You recently penned an op-ed against the Monsanto-Bayer merger. What has the response been like so far? And what does it mean for a Democrat to be making a call to stop it? Austin Frerick: I was shocked by how positive the response to the piece was. People are happy I’m speaking up. But we’ve seen this show before. Chuck Grassley has been a senator for 30 years, and while he has questioned mergers, including between Monsanto and Bayer—but they keep happening! Just from the Democratic standpoint, people are very impressed, and I think they get caught off guard by that: Here’s a Democrat who’s actually going to speak to Big Ag? How has your time working at the Treasury influenced your campaign/your call against agribusiness consolidation? When I was working in the tax policy department at the Treasury, I did a research project on pharmaceutical charity. As it turns out, eight pharmaceutical companies do a quarter of corporate charity. Why? In a paper I wrote on Hepatitis C, I basically argued that Milton Friedman was right—that feels kind of funny to say—when he famously said that corporate social responsibility is usually a cloak for other actions. Hepatitis C meds cost $80,000. So what pharma did is they created all these independent charities that will pay your co-pay—5 percent of the $80,000, or $4,000. So they'll donate $4,000 per person to these charities—and then they get a tax deduction for that charity work and hide that money away in Ireland. It’s comically corrupt. My final paper for the Treasury was about monopolies. We kept noticing more and more risk-free returns—basically, in a perfect market, if everyone makes a profit, someone loses money. It should be zero-sum, but we saw all this “extra return,” which is essentially monopoly profits. You might expect that in the pharmaceutical industry—where you research a drug and you get a ten-year monopoly—but we were seeing it everywhere. And you’d think the barriers to entry to make crackers shouldn’t be that high, but you’re seeing companies that make high monopoly profits. Honestly, it was curiosity about that that led me here. Now, there’s just an illusion of choice. When you walk into a mall and you see Sunglass Hut, LensCrafters, Pearle Vision, Target Optical, Sears Optical—it’s all one company. They’re just hitting different social classes with the same product. How does corporate charity play out on the ground with companies like Monsanto or other major sellers? It’s all PR. When a company does millions of dollars in business a year, giving out a thousand-dollar check is a nice symbolic gesture. For example, I wrote my undergraduate thesis on slaughterhouses in Iowa. There’s a lot of poverty in the smaller communities where these slaughterhouses are, to the point where people can’t afford housing. But the superintendents and mayors I spoke with were telling me how excited they were that Tyson gave them free hot dogs for a back-to-school grill out. Wouldn’t it be better if they could just pay the people more? It’s great that they’re handing out grants, but they’re also hollowing out these communities. In Iowa, we’ve seen half of our seed co-ops close in the last decade. This land is the most productive economically it’s ever been, but the communities are thriving the least they’ve ever thrived. And these communities also bear the brunt of environmental harms perpetrated by big ag. Nitrate runoff and the Clean Water Act has been a big topic in Iowa in recent years. Oh, yeah. My partner is from the East Coast, and he pointed out to me that growing up, it’s very normal in Iowa in the springtime for them to shut down certain beaches, state parks. The nitrates are too high, and you can’t go in the water. It’s kinda screwy that it’s so normal in the culture that you just accept that. You make a lot of comparisons with the early 20th century, when Roosevelt was “trust-busting,” and with the 1980s, when the most recent farm crisis hit. In what way are the struggles farmers facing today unique? What’s scary about the farm crisis, if it’s going to be a farm crisis, is that it’s a different type. The last one was driven by interest rates. At this point, I think the Fed is purposely keeping them low for political reasons. They’re afraid. We’re having all of this conflict this past weekend in Charlottesville, when the economy’s growing. Imagine what happens when the growth rate is at negative 3 percent. It’s incredibly scary that social stability is being incorporated into Fed policy. We’re going to have a record soybean yield, and corn’s already glutted. And in Iowa, somewhere between 30 and 40 percent of corn goes to ethanol, but it seems like battery technology is quickly moving along. So what happens when cars move to batteries? Where does that 30-to-40 percent go? I haven’t had these kinds of conversations yet. And when three companies effectively dominate a market, you just can't organize their places of employment because they can outspend you, and shutting down one plant means nothing to them. I see old-fashioned Teddy Roosevelt-style trust-busting going hand-in-hand with unionization—you bust and then organize. When we talk about a farm crisis, what we’re really talking about a rural community crisis. The thing I’m talking the most about is the child poverty—and child poverty grows in times of economic growth in this country. The poorest parts of Iowa are these small little towns. Welfare reform is a big thing of mine, but we failed with welfare reform. Block granting does not work. I worked on this when I was at the Congressional Research Service. Every state is supposed to regularly convene a panel of poverty experts to rethink how they’re going to spend their money. When I first started working for the Congressional Research Service, I had to pull the plans for from each state. Last time Iowa’s panel met? 1996. Tom Harkin has this great saying: Society is about the lost, the lonely and the left behind. And what does that say when we’re just letting more and more fall behind? When you fund programs through block grants, what you’re really saying is, you’re cutting services to the disabled and to kids with medical conditions, and you’re letting more kids starve. We’re better than this. On a lighter note, you have a pretty great list of heroes on your Twitter bio: Jane Addams, Tom Harkin, Rupaul and Thurman Arnold. Would you talk a little bit about what two of them mean to you? One of my heroes is Tom Harkin. Some forget he was a big human rights person, but he fought for a lot of the Affordable Care Act. He worked to subsidize produce so that students could get free fruit in the morning. And he designed these bills to be funded for the long-term—with permanent, rather than appropriated, funds—so that Congress couldn’t cut these programs. People don’t realize a lot of these things until they dive in. But I also love RuPaul. I met an old gay farm couple the other day in southern Iowa and it’s a personal thing of mine—I’m a young gay man. Gayness in American society is portrayed as an urban phenomenon, so it’s really interesting to see it play out in rural spaces. So I just love the show. It celebrates an art form that a lot of people view negatively. It’s a celebration of difference. I think it will have a lingering impact in our society. So you spend a lot of time talking about Roosevelt. But, preventing the Monsanto-Bayer merger aside, there is a crossover between Sanders’ 2016 presidential campaign and your own. To what extent did that period influence your plans for your campaign and/or your views? Senator Sanders just raised my expectations. He taught me that health care is a right. He made that into a value statement. He expanded the realm of possibilities. We’re on the cusp of a big progressive moment, but I don’t think we can get there without tackling these economic giants. You can pass rules, but when companies like Monsanto have these market shares, they can buy up political influence. We’ve seen this already under the Obama administration. They had good intentions—but if you don’t get at the root cause, these companies are going to be able to eventually buy off the system, and the momentum will be lost. This is a once-in-a-generation opportunity. And I think this is the perfect moment for that.